Sony Computer Entertainment America CEO Jack Tretton has announced that he will be stepping down from his current position to be replaced by current Vice-President Shawn Layden. Tretton was the man behind the Sony PS4 in many ways and last year he delivered the PlayStation presentation at E3. Sony has already stated that the change in management was a mutual decision between SCEA and Tretton himself. 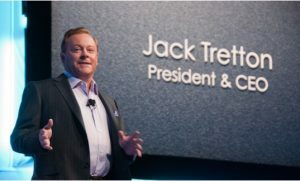 Since the founding of SCEA, Tretton has led the division and has overseen the introduction of every PlayStation console since the original in 1994. The departure announcement comes only a matter of days after Sony announced that it had reached a major milestone of 6 million PS4 sales. Although Tretton has not publicly stated the full reason for his resignation, very few people stay in the same position for two decades, especially in the consumer electronics industry. Now that PlayStation will have a new leader, Sony may take a different direction with its consoles, though the division’s success under Tretton likely means that things will stay the same moving forward. Summary: Sony America CEO Jack Tretton has announced that he is stepping down from his position. Tretton oversaw the release of every PlayStation console during his 19 years as CEO of SCEA. The resignation was mutual between Tretton and SCEA.